Researchers from The Edward S. Rogers Sr. Department of Electrical & Computer Engineering (ECE) have demonstrated proof-of-principle for a device that could serve as the backbone of a future quantum Internet. 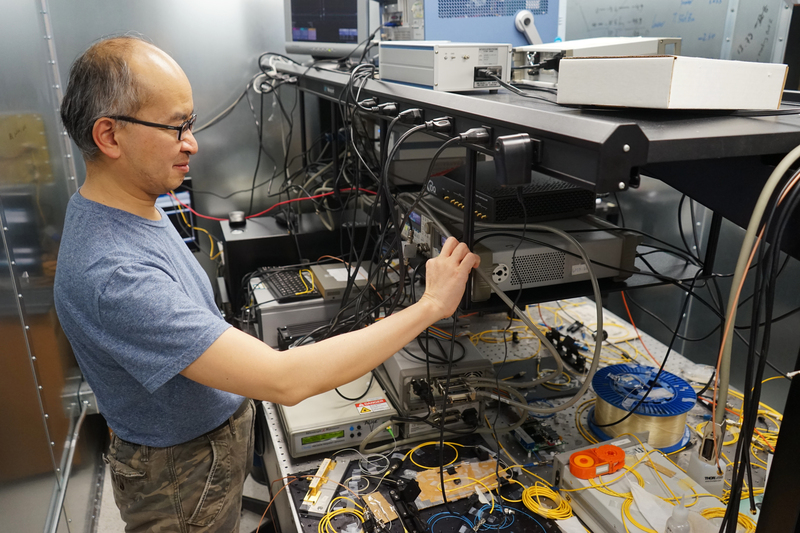 Professor Hoi-Kwong Lo (ECE/Physics) and his collaborators have developed a prototype for a key primitive in all-photonic quantum repeaters, a critical step in long-distance quantum communication. A quantum Internet is the Holy Grail of quantum information processing, enabling many novel applications including information-theoretic secure communication. Today’s Internet was not specifically designed for security, and it shows. Hacking, break-ins and computer espionage are common challenges. Nefarious hackers are constantly poking holes in the continuously sophisticated layers of defence erected by individuals, corporations and governments. In light of this, researchers have proposed other ways of transmitting data that would leverage key features of quantum physics to provide virtually unbreakable encryption. One of the most promising technologies involves using quantum key distribution (QKD) to provide virtually unbreakable encryption. QKD exploits the fact that the simple act of sensing or measuring the state of a quantum system disturbs that system. Because of this, any third-party eavesdropping would leave behind a clearly detectable trace, and the communication can be aborted before any sensitive information is lost. Because light signals lose potency as they travel long distances through fibre optic cables, devices called repeaters are inserted at regular intervals along the line. These repeaters boost and amplify the signals to help transmit the information along the line. But quantum information is different, and existing repeaters for quantum information are highly problematic. They require storage of the quantum state at the repeater sites, making the repeaters much more error prone, difficult to build, and very expensive because they often operate at cryogenic temperatures. Lo and his team have proposed a different approach. They are working on the development of the next generation of repeaters, called all-photonic quantum repeaters, that would eliminate or reduce many of the shortcomings of standard quantum repeaters. With collaborators at Osaka University, the University of Toyama and NTT Corporation in Japan, Lo and his team have demonstrated proof-of-concept of their work in a paper recently published in Nature Communications.